thanks for input in advance! Well you could google search. This topic has been covered a TON. Pierce motorsports is a popular choice as well. Have had little to drive on it but I feel that it does all the things it says it does, I have an autocross event this weekend and I will have a better feel for it after that. I went with it over all else mainly because of its ease of removal, you can just unbolt the 4 nuts, pull out the bar and drop the nuts back on then you are back on the road. I couldn't find another bar that mounted this way, and I didn't want to be stuck with a bar taking up trunk space for road trips. The headache the other bars would take to remove was NOT worth the little benefits you might notice by having the bar. The install was SIMPLE, they have a video! the quality is AMAZING! does anyone know of companies that do chassis bracing for these cars? I installed the STEEDA rear shock tower last week. Really firmed up the ride and keeps the ST on a nice level plane going through the twist and turns. Bang for the Buck, it is a bargain. I did give some serious thought to the Massive bar, but went with the STEEDA because of the customer service and other level of quality of parts that I purchased from STEEDA. STEEDA did have a pretty good sale going on earlier this week. I would also recommend you give some serious thought to picking up the Rear Motor Mount from STEEDA. Last edited by Thieske; 03-27-2019 at 11:56 AM. I have a Steeda rear strut tower brace. Does it work? yes, can it be better? a big yes. 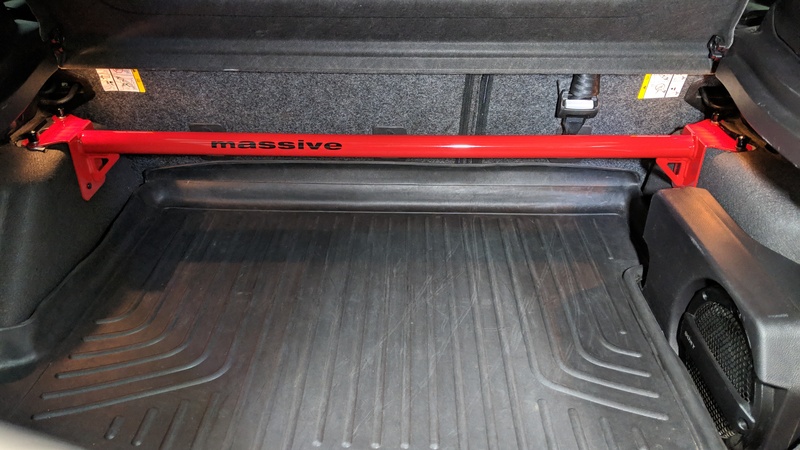 If I buy again, I would choose the Massive brand bar. It is triangulated and has better standoffs. The Steeda vibrates like a guitar base string when you pound on it just so slightly. Last edited by mitch808; 04-08-2019 at 12:28 PM. agreed. I only went with it over the others because of ease of removal. it is told that you get a little more stiffness from it if you put in the lower bolts, but as soon as you do, well you loose that ability to quickly remove the bar so I decided against it. If this every become a weekend warrior and not a daily I will then likely put the lower bolts in and lock it down.